Did Proposal 1 Decamp to Washington? While Michiganders were being entertained and infuriated by the lies of Proposal 1 proponents, few of us noticed that the very same roads funding strife is reaching a crescendo in Washington. The Federal Highway Trust Fund spends about $ 50 billion dollars on ‘transportation’ across the U.S.A. each year. Michigan received $ 1.39 billion from the HTF in Fiscal Year 2014 for new construction of roads and bridges, along with mass transit activities. As a point of reference, Michigan spent an additional $ 2 billion of funds raised within the state for the same ‘transportation’ purposes. 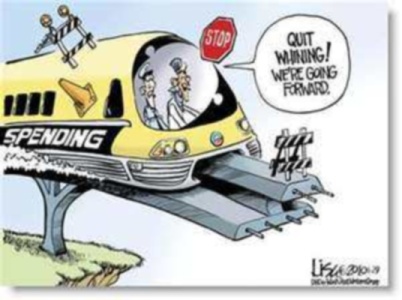 The Federal HTF paid for 40.9% of Michigan ‘transportation’ spending in FY 2014. Funded in the past by an $ 0.184 per gallon Federal gasoline tax ($ 0.244 per gallon on diesel fuel), the Highway Trust Fund’s traditional fuel tax revenues have fallen to about $ 34 billion. The Federal government has been supplementing the Highway Trust Fund from general deficit spending revenues since 2008. In Fiscal Year 2014, the Federal government supplemented the Highway Trust Fund with $ 11 billion in general revenues. On the spending side, the Highway Trust Fund has been pillaged for everything from bike trails and green spaces to empty buses and trains. Only leftovers – about 68% of HTF funds – go to actual road construction and repair. The Government Accountability Office prepared a thorough 18 page analysis of HTF diversions in the middle of the last decade which is worth your attention. But this isn’t the end of misappropriation. Prevailing wage mandates, ancillary Federal construction mandates, and the incestuous contractor/contractee relationships exposed in Michigan’s Proposal 1 conflict further diminish the funds available for actual road & bridge projects. On the revenue side, the much touted Obama recovery is a despicable lie. 93.2 million adult Americans out of the labor force in April with no money to buy fuel. American gasoline consumption today is well less than half of what it was in 2007. That 93.2 million may not be unemployed for BLS propaganda statistical purposes, but they most definitely are unemployed when it comes to purchasing gasoline. Thus gasoline tax revenues have fallen off a cliff. Diesel fuel consumption has been more stable over the same period, so HTF revenues haven’t fallen as much as gasoline consumption declines would suggest. The stability of diesel fuel consumption should clue you into why roads and bridges are deteriorating apace despite much lower usage by passenger cars. Heavy trucks do the vast majority of the damage. The overarching point here, however, is that HTF revenues have now fallen far below the demands being placed upon them during the past eight years. The current $ 11 billion annual supplement to the Highway Trust Fund expires at the end of this month, on May 31st. The U.S. Department of Transportation’s FHWA has told state DoTs and mass transit agencies to expect funding curtailments late in July or early in August. State DoTs are already deferring some expensive projects until they are certain of funding. 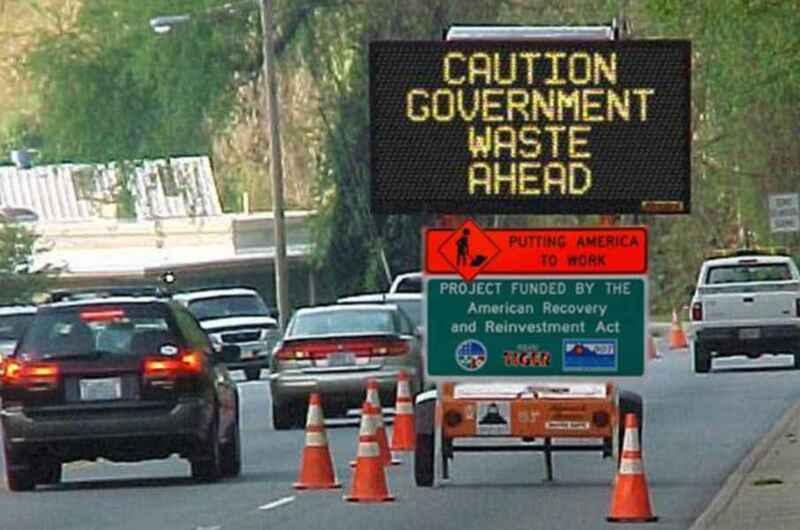 The FHWA directs most HTF revenue to the states by refunding approved state level expenditures, so the state DoTs are fearful of getting caught holding a very expensive bag if they cannot get timely reimbursements. Senators originally proposed a special, reduced tax rate on profits held by U.S. corporations in their overseas accounts. This ‘repatriation tax’ proposal ran into a wall of skepticism because no one knows how much money would actually be repatriated and the details really didn’t work. A lot of the ‘overseas money’ targeted for this special treatment has actually been invested in overseas operations, with the notable exception of Apple’s extraordinary cash holdings. Now Republicans are leaning towards extending the annual HTF supplement while a longer term solution is crafted. 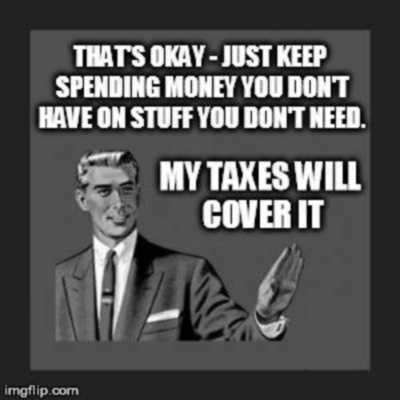 The left, however, sees yet another crisis to be exploited by raising taxes. The Hamilton Project at the Brookings Institution, in a ‘discussion paper’ entitled “Financing US Transportation Infrastructure in the 21st Century”, is promoting a close copy of Governor Snyder’s ratcheting gas tax. Others on the left want to boost the fuel tax by up to $ 0.15 per gallon, with various types of annual ratchets. The American Trucking Association (ATA) went so far as propose the tax increase be on gasoline exclusively, bringing its tax level up to that of diesel fuel. They have quietly removed that non starter from their web site after it provoked considerable outrage. Only in Michigan is diesel fuel taxed at a lower rate than gasoline. Everyone who makes money off roads and bridges one way or another is right in the thick of this conflict proposing how much more you should pay for their benefit. AASHTO, ARTBA, U.S. CoC, LIUNA, ASCE, ATA, APTA; just to mention the major acronyms whose lobbyists are in the thick of the fray. These are the national parents of the organizations which pumped $ 10 million into SafeRoadsYes! The ‘acronyms’ will be putting a lot more money into the Federal HTF conflict because ten times more money is at stake in the Federal HTF. The ‘acronyms’ will also be fielding their ‘A’ teams in Washington, unlike the ‘F Troop’ they fielded in Michigan during the Proposal 1 conflict. The only good news for taxpayers here is the ‘acronyms’ haven’t been able to buy off the national media to the same extent they bought off the Michigan media during the Proposal 1 conflict. But that other annoying aspect of Proposal 1, gratuitous largesse to the Democratic base, is not entirely absent in the HTF conflict. Mass transit advocates are demanding a 115% increase in spending upon empty trains and buses, from $ 10.5 billion to $ 22.5 billion per year. This would be almost half of the current HTF revenues! State and big city municipal politicians are determined to preserve the 32% siphoned off from the HTF for sidewalks, scenic landscaping, metropolitan planning, law enforcement grants, mass transit, and their ever expanding parade of non road programs charged to the HTF. Proposal 1 may be dead, but the philosophy of Proposal 1 is very much alive, at least in Washington. Stick the passenger car owners/operators with the vast majority of mass transit costs. Mass transit which they do not use or want. What passenger car owners/operators don’t pay through vehicle registration fee increases for the RTA boondoggle will come straight out of the HTF, right out of road repairs and improvements. So the pernicious Proposal 1 raid on your household budget wasn’t really defeated, it has just decamped to Washington. And you will not get a chance to vote on any Washington action, so it is now time to light up your U.S. Senators’ and Representatives’ phone lines. Now that Proposal 1 has been TROUNCED, as we knew it would be - It is time for the MILeg and MIGov to concentrate on JUST fixing the broken Roads, NOT more $$$ for "Transportation Fund" and all the excess it entails use a TEMPORARY SPECIAL "EXISTING" ROADS REPAIRS [only] FUND. NO MORE GENERAL FUNDING TAX INCREASES... Our Roads, like our Schools, need REAL REFORMS not just more money thrown at them and Patrick Colbeck and a few other Legislators are the only ones demanding we look at how and for what we spend our money on to Fix Michigan Roads. Many in Lansing, Government's in general, only solution to anything is a TAX INCREASE! It's time for Government to actually review and FIX AN ACTUAL PROBLEM rather than just throw money at it. The Governor, and far too many Legislators, want to put money into the General Transportation Fund; which would mean more money on Bike Paths, Road Landscaping, and yet more diverted to subsidize Mass-transit also; whereas those I support want more money to go to ONLY FIXING BROKEN ROADS (and not even toward more new Roads), for which the Price-tag is actually far less. FIX IT, DON'T DEMAGOGUE IT!